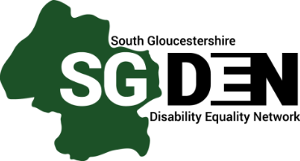 An exhibition showcasing the work of local disabled artists is being hosted by South Gloucestershire Disability Equality Network (SG DEN), a community organisation run by disabled people to advocate on issues of concern on behalf of local disabled people. The “Ability not Disability” exhibition will take place at Under the Edge Arts in Wotton-under-Edge on 26-27th September, with disabled artists who have a connection to South Gloucestershire invited to exhibit across a range of art forms. Art will be available to purchase and entry to the exhibition will be free. The exhibition is taking place in memory of Sue Liebow, who was Chair of the Trustees of the organisation before she sadly passed away earlier this year. Sue was aware that some disabled artists struggle to get the opportunity to sell their work for a fair price, and so conceived the exhibition to help tackle the issue. The majority of the proceeds of the sale will go to the artists and the remainder will go to create the Sue Liebow Fund, a bursary which the group hopes will create further positive change for the local arts community.